Chris and Lyn Demuth farmed 8 acres of Pinot Noir and Chardonnay in the hills north of Boonville in the Anderson Valley. The vines, over 20 years old, are planted at a marginal site at 1,700 feet, on of the highest vineyards in the region. The Pinot Noir clones are Pommard and Wadenswil and the Chardonnay is old Wente. 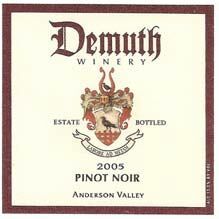 Small quantities of Pinot Noir and Chardonnay were made under the Demuth label, but most of the grapes were sold to boutique wineries such as Adrian Fog, Anthill Farms, Skewis and Whitethorn. In 2011, the Demuths retired and sold the property to the Knez family. Winemaker Anthony Filiberti was brought on to manage the vineyard and produce the estate wines under the Knez label. The vineyard has been converted to organic and biodynamic farming.